It is dark in the highest hill, because of the stone with which it was built, for the massive lines of its houses that climb as a pyramid to the fifteenth-century fortress, a geometric block on the going down lines of the roofs, even though in his coat of arms there is a hand that in each time has been a symbol of loyalty and hospitality. Manciano was Presidio of Aldobrandeschi since sec. XIII, with the division of the family (1274) it went to the branch of Sovana, and from this, from 1293 onwards, to the powerful Roman family of the Orsini. 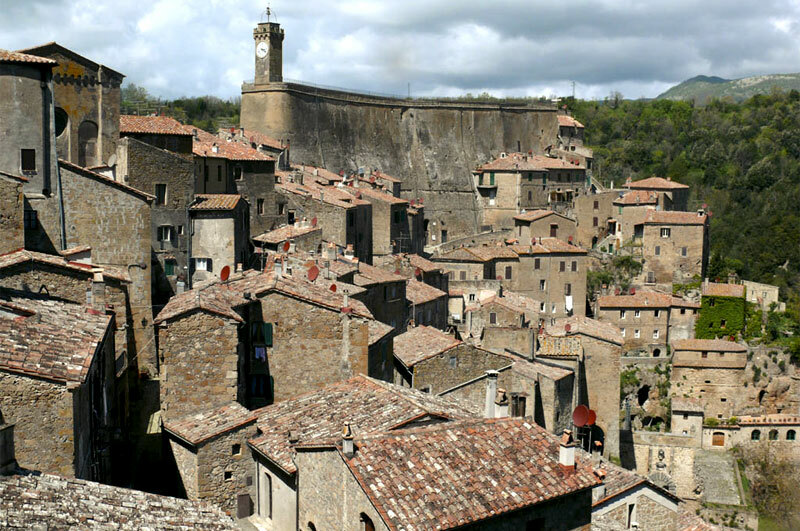 During the ‘300 it was repeatedly fought over by the Municipality of Orvieto, the Basques, the lords of Montemerano and the Orsini of Pitigliano. It was conquered in 1416 by the Senesi, who strengthened the fort and raised the walls; it was granted in 1557 to the family de Medici, later belonged to Lorena who in 1783 made it the capital of a large community, which included those of Montemerano, Capalbio and Saturnia. Descending from the formwork to the village, divided into narrow and picturesque streets, we find the Clock Tower (1615), the Church of San Leonardo, Piazza Garibaldi with a central monumentd fountai by Rosignoli, Porta Fiorella. Near the castle, head office of the town hall: there are paintings of local painters such as Pietro Aldi (1852-1888) and Paride Pascucci (1866-1954), there is the Museum of Prehistory and Early History. The museum is divided into five rooms, one for each phase of prehistory, which collect artifacts from the Paleolithic to the Bronze Age. It was at first an Aldobrandeschi Castle, then dependent on the Basque family, from Orvieto; it belonged to Siena in 1382, and finally to the Medici. Siena made Montemerano a safe fortress inside three circles of walls and in 1489 gave to it its own statutes. Good governance and art, and this, throughout the fifteenth century was Senese. The town is surrounded by olive groves and with a countenance well preserved, is dedicated to the severity of the Middle Ages, but also of the hospitality. The medieval walls, still largely visible, was punctuated by towers; you can enter the village, enclosed in walls and developed around the core of the castle, by two doors located to the north and south. TheChurchofSan Giorgio, of a Romanic-Gothic style, reconsecrated in 1430, is particularly rich in works of art of Renaissance from Siena: important fresco cycles, the polyptych of San Pietro (1458), the altarpiece from vecchietta, The Madonna of Gattaiola (attributed to a teacher of the school Sassetta), St. Peter (wooden statue from Vecchietta), carved and gilded wooden tabernacle (XVII). Little remains of the Pelasgian city, that the Etruscans called Aurinia and the Romans called Saturnia, in addition to are visible the tombs with a monolithic slab of belonging dolmen, in reality of the VII-VI century BC,; you can see some portion of the city walls, of the IV-III century BC. and Porta Romana that, sormounted from the road and the arc, summarizes the three civilizations absorbed by the country: the Etruscan, Roman and medieval. Inside the walls are visible evidences of Roman period: some stones, a great angular pillar, squared sketches of travertine, the remains of a large tank, probably for water conservation and called Bagno Secco, the remains of a “castellum acquarum” incorporated in Villa Ciacci. Near Porta Romana there is the Villa Ciacci built in 1929 designed by the architect Passeri; the project has been placed on the top of the Renaissance castle of 1464, of thet period are the battlements, two cylindrical towers at the corners of the walls. In the Church of S. Mary Magdalene (remaked 1933 remake in from an old Romanesque church) you can find a panel with the Madonna and Child between Saints Sebastian and Maria, attributed to Benvenuto di Giovanni (XV). Around Saturnia, near the river Albegna there are vast and scattered necropolis that testify a certain development until the fifth century BC, and they have been identified in the area of Sede di Carlo, Pancotta, Pian di Palma, Puntone. the village of the twentieth century. The castle, appointed since 1161, was destroyed in 1384, it became a fortified farm, since 1761 it is the property of the Princes Corsini. In Marsiliana was located the city of Caletra, one of most significant centers of the area of Vulci, which was destroyed in the seventh century BC. In the area are localized important necropolis tombs “a circle”, characterized by from Circle of Ivories come ciborium, a comb and a writing tablet in ivory. Other important examples of Roman times are located in Poggio Murella, there is the “castellum acquarum” Roman cistern intended for water tank and a cylindrical tower in opus reticulatum. 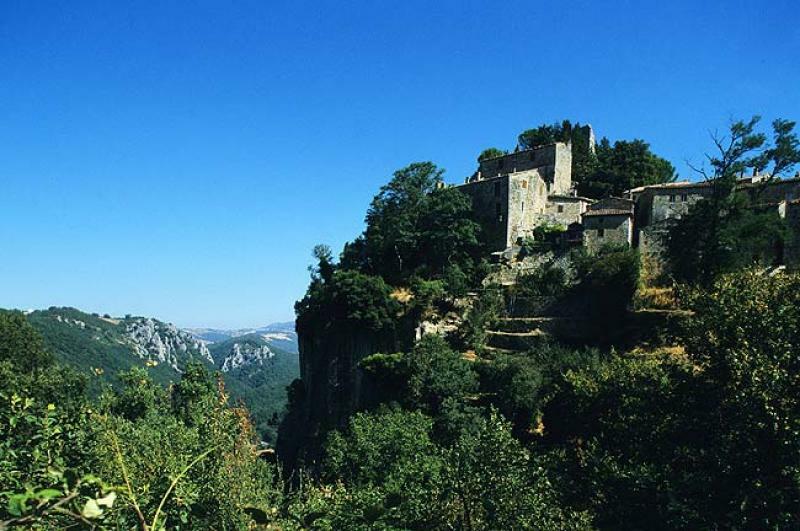 There are also, throughout the territory, castles and fortifications, some of them reduced to ruins: rock of Montauto, Castle Palmula (Poggio Holy Bath), Scarceta (Castellaccio Pelagone), Stachilagi, others restructured and private property such as La Campigliola, Scerpena and Marsiliana. A rocky spur overlooking the valley of Albegna gives its name to Roccalbegna: the village built in the thirteenth century by the Republic of Siena according to a plan, extends between the fortress with remains of fortifications from Aldobrandeschi and Siena and the stone that hangs the country. TheChurchofSt. Peterand Paul is the most significant of Roccalbegna. 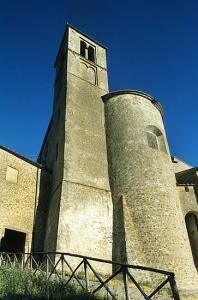 The church contains one of the masterpieces of Ambrogio Lorenzetti. In the nearby Oratory of the Crucifix is placed a small museum with works by Francis Nasini, Sebastiano Folli and, above all, Luca Tommè, a painter of the Senese school. 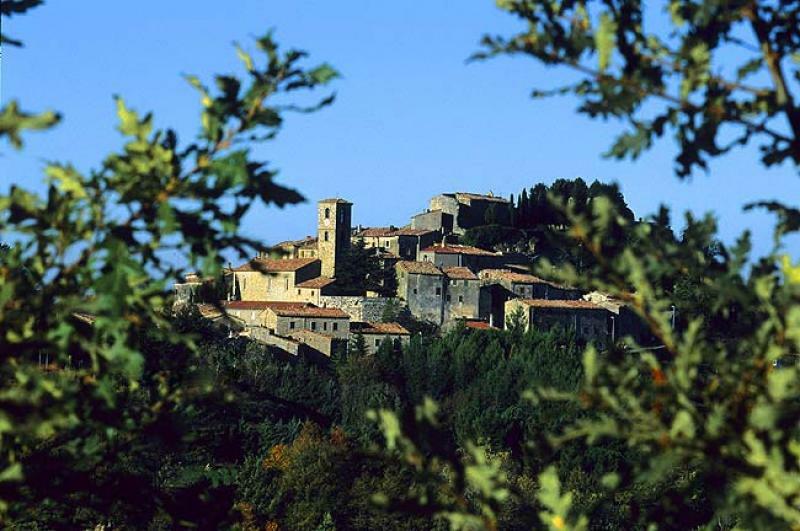 A visit to do is to rise to the formwork and especially to the stone: from the top the view opens out over the rooftops of the village and the gorge of Albegna up to the nearby Maremma. 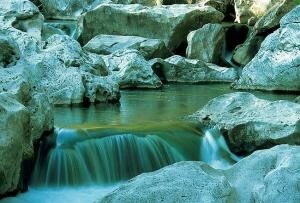 It’s a country of dark tufa, built on terraces cut into a open rock and made steep of the creek Lente. It looks like a block of parallelepiped crystals, to an urban landscape invented by a cubist. It ‘s probably of Etruscan origin, as would suggest the chamber tombs discovered along the road that goes to Elmo, but his name Soranus witnesses to the Roman origin. 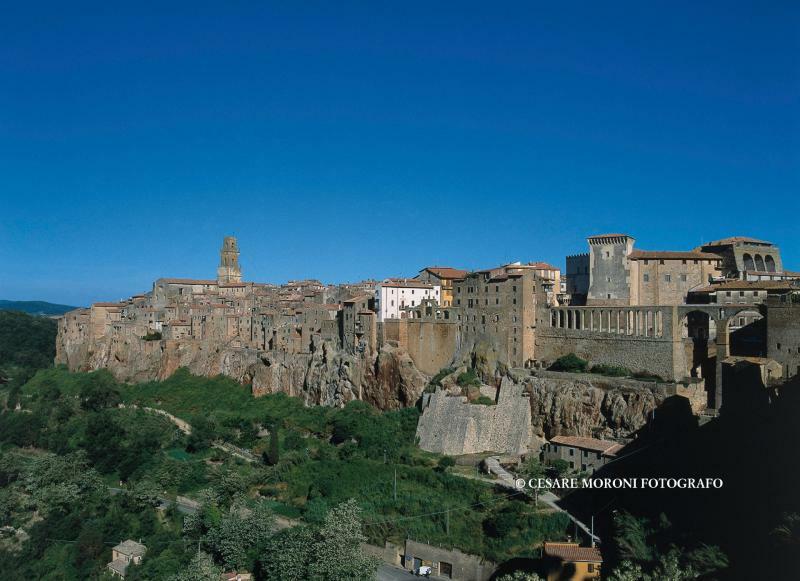 On the houses rests the “Masso Leopoldino”: high tufa rock in the top of which there is a terrace overlooking the town, the gullies and valleys of shadow around it. On the side closest to the church of S. Niccolò you can see the unique clock tower. There are few remains that testify to the Middle Ages of Aldobrandeschi: all speak of the presence of the Orsini or has a rustic flavor of exceptional charm. In the village, there are the sixteenth-century church and the remains of the palace of counts: the portal and courtyard. The Fortezza Orsini (XI-XII century. ; renovated in the XV-XVI sec. ), a powerful military fortification that allows, even along its underground walkways, to understand many aspects of military life during the Renaissance. It was linked to a defense system whose powerful remnants can be seen in Montorio, Castell’Ottieri and Vitozza. The ancient Sovana was the birthplace of Pope Gregory VII (Hildebrand of Sovana), it is one of the major Etruscan centers of Maremma. He it didn’t have a continuous life: it was inhabited in the seventh, sixth and fourth centuries BC. Its peak coincided with the surrender of Vulci to Rome in 280 BC. it was a diocese bishopric already in the sixth century. The thirteenth and fourteenth centuries are datable the medieval buildings. Highlights are the Cathedral of IX-XI century, then rebuilt in 1300. The castele and the curch of S. Mary are of the thirteenth century in whose interior is a beautiful tabernacle of IX-X century. In the hills around are Etruscan tombs. The big temple tomb, said Ildebranda, renews the memory of Gregory VII Sovana. The room below is accessed by a tapered dromos, it is extremely simple, which contrasts with the ornate exterior: it has a sloping ceiling with central beam and on the bottom, a bench with two cavities, designed to contain, at the center, a wooden sarcophagus decorated with bronze studs. The deep and shady hollow streets hollow are spectacular (or “Tagliate Etrusche”) paths or real roads carved in tuff. Among the most evocative is “The Way cave of St. Sebastian” and “The Cavone”. Vitozza in Loc S. Quirico is one of the most ancient settlements of the central Italy with more than 200 caves, inhabited from prehistory until recently. The ancient settlement extends along a ridge of tuff in a pristine natural environment. Along the path that runs along the site are the remains of the three fortresses, with its moats, the church of S. Angelo and a remarkable “Colombaro” Etruscan-Roman. Scansano is an example of a rural alive settlement live from the Middle Ages and grown spontaneously according to the needs of the moment. The houses, close to each other, occupied the smallest space and created a community with close family ties. It is an example of a fortified medieval and Renaissance villa. It has a main building “L” with four towers at the corners. The door of Scansano is defended by two archer towers and from a chimney piombatoio. We recommend a visit to the Palace of Praetorium, solid medieval building, the Palace Vaccarecci (which still puts on display the family coat of arms) and the Church of St. John the Baptist. This area is also famous for its Morellino, a ruby-colored wine with a full-bodied aroma. 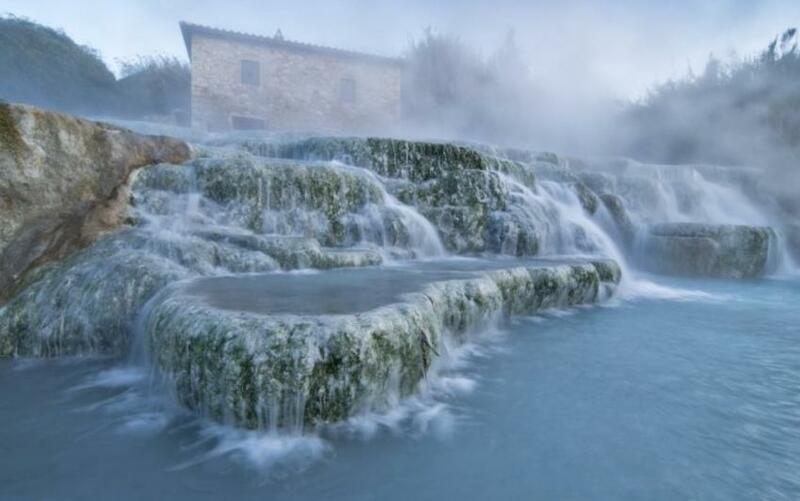 Outside the town of Scansano, on the road leading to Saturnia, we recommend a stop to the ruins of Ghiaccio Forte, a fortified town which was destroyed by the Roman army in 280 BC. The Etruscan settlement was identified in 1973 as a result of excavations, in addition to large portions of the walls, they brought to light the structures of the urban plan. The next, even if brief excavations, the last of which dates back to 1981, have allowed us to ensure the destruction of the town by fire, the identification of a votive deposit rich in finds of bronze and terracotta , the identification of a melting furnace, the location of three access ports to the village and some of dwelling rooms. Recently, the archaeological site was purchased by the Municipality of Scansano and can be visited by following the directions of the tourist road signs. Semproniano is a small village with an incredibly beautiful and well preserved historic center:narrow streets, old stone houses, travertine balconies from which you can enjoy an amazing landscape. The village lies on a hill overlooking Albegna valley . 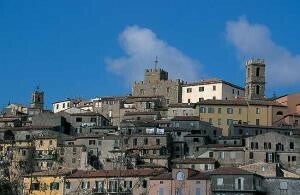 The first unit was built before year1000, along the road coming from the port of Cosa in direction Amiata mountain. Later, a mighty city defense walls was built, with the squared stone still visible today. The castle, at the beginning property of the Aldobrandeschi, in the twelfth century it passed to the County of Santa Fiora. Initially 1300 was attacked and became part of the Republic of Siena. Disputes with the Orsini of Pitigliano not allowed, however, the final transition to the Republic of Siena until 1400. After the fall of the Republic, Semproniano passed to Medici family and later, in 1737, to the Grand Duchy of Tuscany. The oldest part of the village is developed around the fortress aldobrandesca with the buildings arranged in concentric semicircles. At the top is situated the church of Santa Croce that contains a painting of the seventeenth century, depicting the Pietà, a font Renaissance travertine and a medieval wooden crucifix incredibly fascinating. Halfway there is the old Romanesque church with a bell tower 23 meters high – the only church built by the Aldobrandeschi remained miraculously intact. Inside you can admire seventeenth-century paintings, a Madonna DSL Rosario by Francesco Vanni, a fifteenth century font and a baptismal font. 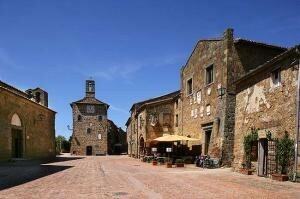 We advise you to stroll through the narrow streets and do not miss the romantic Piazzoletta. 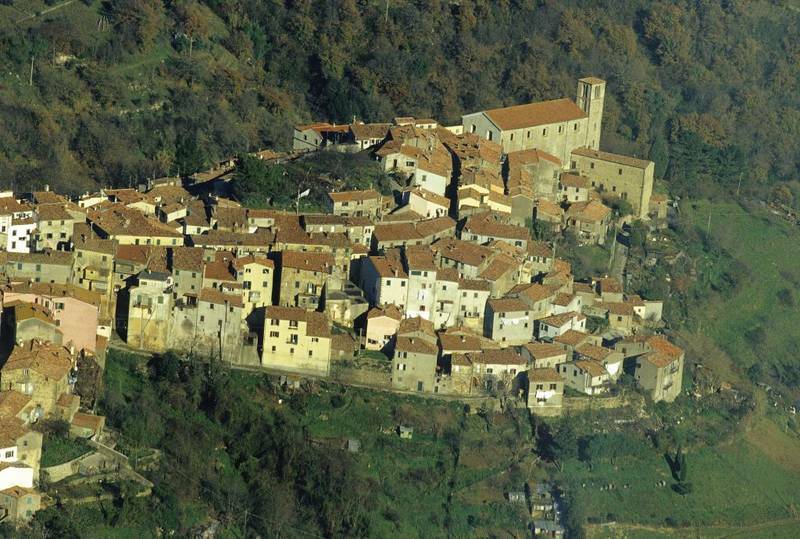 Three kilometers from Semproniano there is the small and amazing village of Rocchette di Fazio. Built on top of a cliff overhanging on Albegna river canyons, right in front of the WWF Rocconi Oasis. You can visit here the 12th century Rocca Aldobrandesca , the s.Tomme Ospedaletto (1330), the Court, the Public Palace and the Parish of Santa Cristina- Romanesque style -in this church are preserved 15th century frescoes. Another small and panoramic village is Catabbio – on clear days, you con see from here the Argentario promontory and the Giglio island. A must see in the village is St. Anna Church and in Contrada Scalabrelli, the old S. Lucia church. 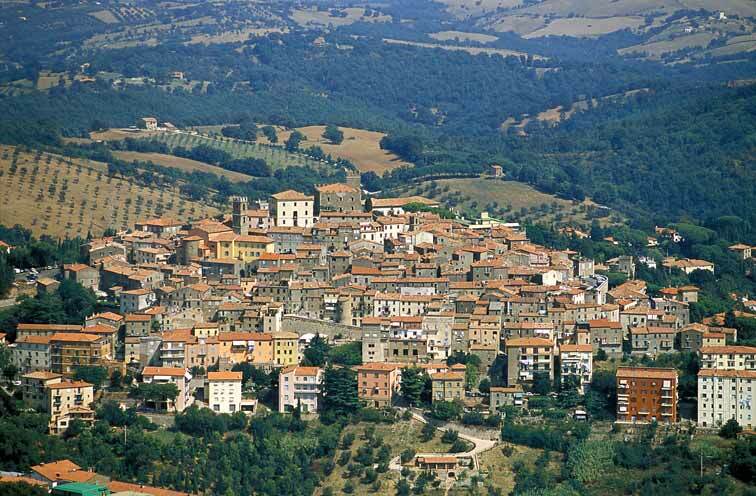 Cellena is another small fraction of Semproniano and is located on the road leading to Amiata. It’ s the highest point of the village overlooking the course of the Fiora river. 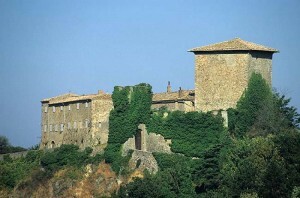 Petricci is the most recent part of Semproniano, it offers to the tourist enchanting landscapes and the Castle Calizzano. C.r.a.s.M. was created in 1997 from the collaboration between WWF Tuscany Delegation and Provincial Administration of Grosseto. The main functions of the Centre are to treat wild animals injured, sick or otherwise in need, in view of their reintroduction in nature and that the captive breeding of rare or even endangered. A particularity , unlike other similar structures, is that it can accommodate any of the specimens of native species (not only birds, but also mammals and reptiles). The centre, along with the Monte Amiata Animal Park and the Pescinello Natural Reserve, is also one of the venues of the proposed captive breeding of the Egyptian vulture (organized by WWF Tuscany and in 1997 it obtained the important result of the first birth in captivity of our country, which is also one of only three in the world). 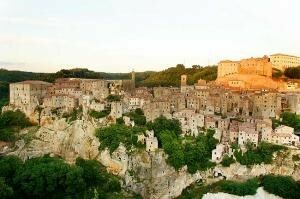 Admiring Pitigliano at sunset time from Madonna delle Grazie church (dedicated as a votive offering for the plague of 1527) is a spectacular unforgettable experience. 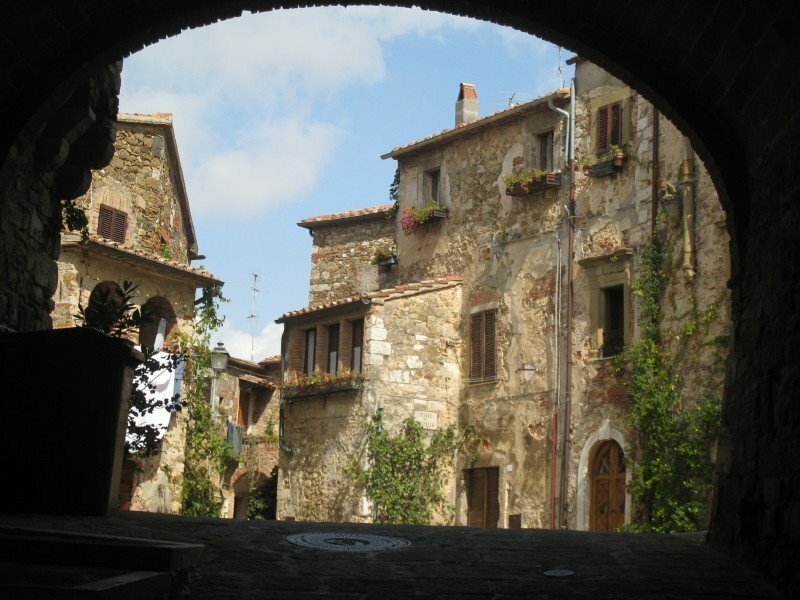 Similar to Orvieto, but more primitive and more intimately melted with nature due to the vegetation that clings on him and the greyish rock cuts perpendicular to the road; a place of shadows and lights, cut corners and squares, where human sense is perceptible in broken lines that shape the roofs, the castle and the giglio tower. You can feel civilizations and cultures changing : the prehistoric one with Eneolithic rinaldonian discoveries; the Etruscan one sign Vulci, especially the Eastern archaic phases, with some greek product; Roman civilization unifying peoples and the medieval one signed by Aldobrandeschi, the greatest dynasty of central Italy, lords of the Maremma for about half a millennium; the Renaissance greatness of Orsini noble Roman family,vainly attacked by Pope Alexander VI and his son Valentino and, after a brief presence of Siena, the Medici and their heirs, the Lorraine. All this in approximately 3500 years! The town is dominated by the Orsini fortress with its beautiful Renaissance courtyard in which shows a well with Aldobrandeschi and Orsini emblems; inside the building there is a museum with archaeological and art objects, in the Republic plaza you can notice a piece of a beautiful sixteenth-century aqueduct. A Capisotto there is a sixteenth-century Church of Santa Maria, in the square named after Gregory VII there is the cathedral which houses paintings of Cozzarelli (sec. XV), Francesco Vanni (sec. XVI), of Zuccarelli (sec. XVIII) and dell’ Aldi (sec. XIX). 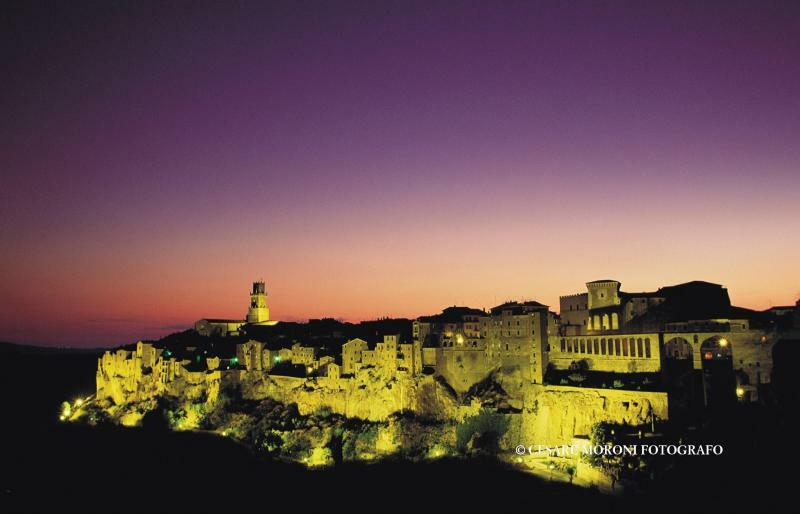 Pitigliano is also known as Litlle Jerusalem due to a remarkable Jewish presence which has contributed greatly to its economic and social development : you can appreciate the Synagogue -recently restored, the Museum of Little Jerusalem, Forno dele Azzime and the Jewish cemetery. Pitigliano is also famous for the many Etruscan remains – At Poggio Buco (9 km. direction Manciano ) Etruscan tombs are still visible. 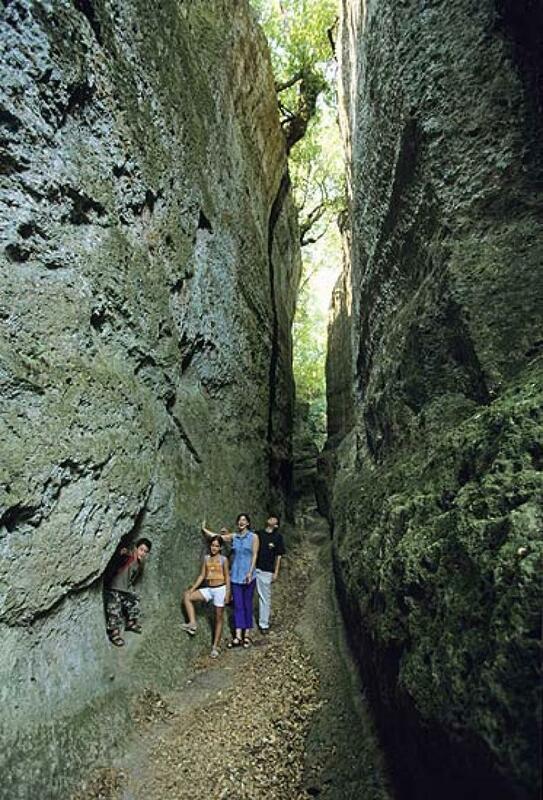 And if you like walking, Pitigliano can offer a number of unique pathways : roads carved into the tuff that connect Sovana, Sorano and Pitigliano. Recent studies provide two possible solutions of use: a rational one (a way for people and goods to travel) and a spiritual one (paths connecting the necropolis). Both fascinating !